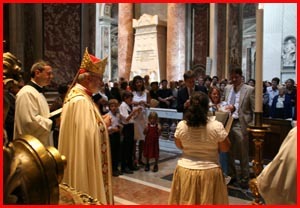 This morning, I had the great joy of celebrating a baptism in the baptistry at Saint Peter�s Basilica. It was the first time that I ever had the privilege to have a baptism there. It was a very moving experience�and at the same time it was a bit like celebrating a baptism in Grand Central Station because there are thousands of tourists walking around inside the Basilica. Logistically, the sacristan and officials had to place some stanchions near the baptismal font so that we could proceed. I�m sure that over the course of the last 500 years there have been many children baptized at the huge St. Peter�s baptismal font�.children of kings and children of peasants, from every nation under heaven. It was certainly special. However, I believe that any baptism is a great event. It is Christ who is acting through the sacraments and the child or adult who receives baptism is being reborn into God�s life. It is very significant. At Jesus� baptism in the Jordan, the voice of the Father was heard��This is my beloved Son, in whom I am well pleased….� In baptism we become God�s beloved children. It�s the beginning of our vocation � a call to holiness, a call to discipleship, a call to be a member of a family, a faith. It�s a call to be part of a communal mission, to work to make God�s presence more visible, to build a civilization of love where there�s greater justice and greater concern for those in need. It�s a wonderful event, not only for the family, but also for the entire community of believers. Baptizing Declan Sean Kennedy At St. Peter’s. The child that I baptized is Declan Sean Kennedy, son of Sean and Gina Kennedy. When Sean graduated from Georgetown University, he became a lay missionary, working one year in Samoa and then working with me in the West Indies for two years. During his tenure in the West Indies, he started a shelter for the homeless. We named it �Bethlehem House� because in Bethlehem, Jesus, Mary and Joseph were homeless and there was �no room at the inn.� Sean did a wonderful job and was a fantastic example to the young people of my Diocese. After he left his three years as a volunteer, he went back to school to study public health. He then went to work for the United Nations and was in Africa for a while. He and his wife, Gina, came back to the Islands after they were engaged and I married them. It was quite an event because many of their relatives came to the ceremony in the Islands. Sean and Gina are originally from Utah, which is very interesting � there are not many Catholics in Utah. Sean said, �Being a Catholic in Utah was like belonging to a very exclusive club.� Both Sean and Gina work for agencies of the United Nations � Gina dealing with world hunger and Sean is making strides with agriculturally challenged areas of the world. They have been living here in Rome for a number of years and after many years of praying to have a child, they�ve been blessed finally with a little baby. I was so pleased when they e-mailed me and asked me if I would have the baptism. I knew that I�d be coming over here at this time, so it worked out very well. The baby was born a couple months ago. I suggested that we might try to do the baptism at St. Peter�s. I thought that would be something that Declan would know his whole life � that he was baptized there at St. Peter�s. It would be so wonderful – the fact that we could do it so near to where St. Peter was buried�.this spot�for two thousand years, Christian Pilgrims have come here, St. Patrick was sent to evangelize the Irish from here, St. Boniface was sent to evangelize the Germans from here, St. Ignatius�.every great personality in the Church�s history has come here and prayed and found inspiration in this place. So to have a baptism here is a very special thing�.and not just because of the architecture or the beauty of St. Peter�s – it was built to be a beautiful place � in that period of the counter-reformation, the beauty of the Baroque churches was intended to give people a glimpse of God�s beauty and of heaven. For us, if there was no church here at all, just the fact that Peter was buried here�and as Jesus said �upon this rock I will build my Church,� and indeed the Church is built on the rock of Peter�s faith, his commitment and his martyrdom. So, it was a very special event. Sean and Gina were both thrilled. The baptism today was special for me, as well. These are friends and people that I am very pleased to see that God has blessed with a child. I know that they will be very good parents and instill that spirit of service and generosity that has been characteristics of their lives. They are people with a sense of vocation, giving their lives to work for the betterment of humanity. 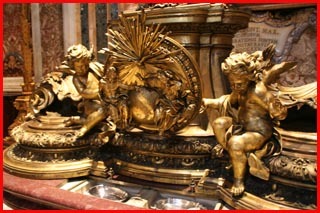 Ornate St. Peter’s Baptismal Font. You can see the rather large crowd of people inside St. Peter’s that were attracted to watch the baptism. Entering St. Peter’s Basilica this morning for the baptism. 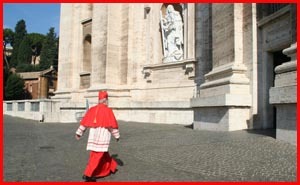 I wore my �Cardinal Reds� today because I was in the Basilica of St. Peter. It was a bit embarrassing and a bit amusing to see the ushers �parting the �Red Sea�� through the crowd�lol. Meeting with new Cardinal Secretary of State, Cardinal Tarcisio Bertone. 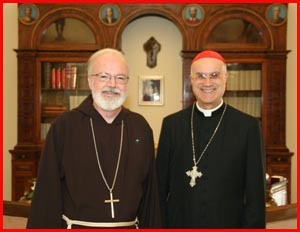 This afternoon I went to visit and have a meeting with the new Cardinal Secretary of State, Cardinal Tarcisio Bertone. I was able to talk with him about the situation of the Church in Boston and share with him some of my hopes and aspirations for the future of our Archdiocese. We also touched on our request for new Auxiliary Bishops. I also reminded him that one of our Auxiliaries, Bishop Emilio Simeon Allu�, is a member of his community, as a Salesian. Cardinal Bertone is quite outgoing and very friendly. 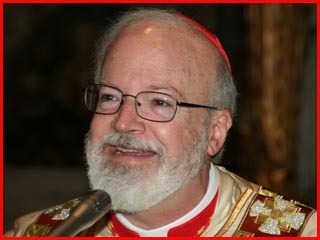 He just recently began serving in his new role as Vatican Secretary of State. Previously, over the years when he was Archbishop, one of his great joys was to do a little sports broadcasting for the soccer games in Italy. As Secretary of State, he serves in a role that one could describe as the �Vice President� of the Church�.much like our Vicar General and Moderator of the Curia in a Diocese, who administers so much of the life of the Church. Cardinal Bertone is a very important figure in the life of the entire Church. We had a productive and enjoyable visit. Torre di San Giovanni – Tower of St. John. It was also very interesting to see where his office is located in the Vatican – in an old tower in the Vatican wall, called Torre di San Giovanni – Tower of St. John. 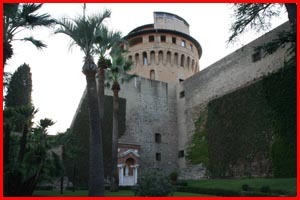 It�s a tower that was built many centuries ago with the purpose of protecting the Vatican from invasion. We noticed how the wall has a passageway so that people could have escaped from other parts of the Vatican into that tower. 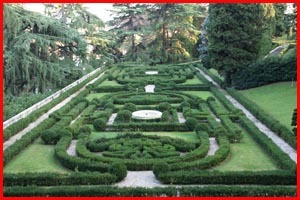 Passing by parts of the beautiful Vatican Gardens on the way to Torre di San Giovanni. 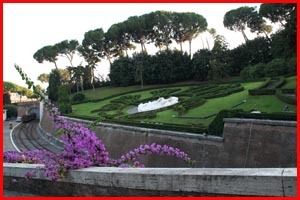 More of the Vatican Gardens. 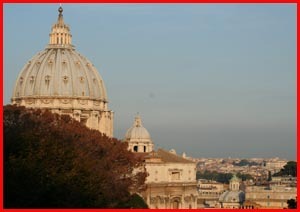 View of St. Peter’s Basilica and the city on the way to Torre di San Giovanni. I am very much looking forward to tomorrow�s Mass and ceremony at Santa Maria della Vittoria. It will be a very significant moment. 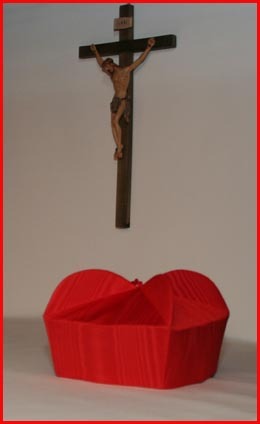 The Mass is very ceremonial, but more importantly, it is symbolic of the connection of Boston and Boston�s Cardinal-Archbishop, with the Diocese of Rome, which is the Diocese of St. Peter – the place where the center of Christianity resides and which is the guarantor of the unity of the Church throughout the world. I have received a few comments from people who indicated that they are having difficulty finding previous posts � one may access each day�s post by clicking on the corresponding date in the calendar on the right side of the screen.